What defines high speed in electronic design? What is meant by a 50 ohm impedance? Deep Dive - DC impedance? 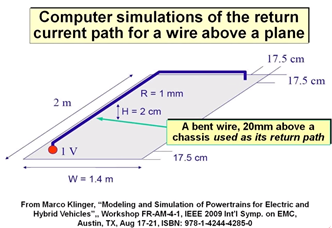 In the January 2014 webinar High Speed Design Rules, we showed an experiment whose results seemed to defy the rule of thumb that states electricity takes the path of least resistance. Connect a power supply to a metal table and run the wire output of the power supply parallel to the table. After a 2m run, bend the wire 90 degrees and run it for 1.4m before bending it again onto the table. Now power up the circuit and measure the current density. One would expect the current return path to run the hypotenuse of the circuit triangle. Yet, this does not happen! So what’s the deal? Is this a current or voltage phenomenon? Actually, it is a fields phenomenon. The key to controlling all forms of interference, including EMI, is to control and contain the electric and magnetic fields in our printed circuit boards. Many of the common PCB design practices used by designers allow fields to spread, creating the issues we often encounter. Our webinar this month, PC Board Design to Contain and Control Fields, will be presented by Rick Hartley. Rick has decades of high-speed design experience and has led the way in many of the bespoke practices used today.